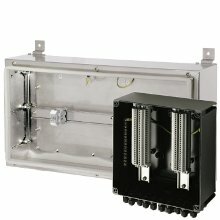 This range of Exe enclosures offers a range of enclosure sizes, terminals and cable entries. Available in 316 sheet stainless steel and in GRP, these enclosures offer a variety of sizes which will suit most applications. Enclosures may also be coupled together to form large control panels. The enclosures are suitable for use onshore or offshore where light weight combined with a high level of corrosion resistance is required. Zones 1,2 and safe area. UL Listed for USA & Canada. Class I, Div 2, Groups A, B, C,D. Class I, Zone 1, Groups A, B, C, D.
Class II, Div 1, Groups E, F, G.
Certified Temperature: –55°C to +55°C. Impact resistant GRP or 316 stainless steel.